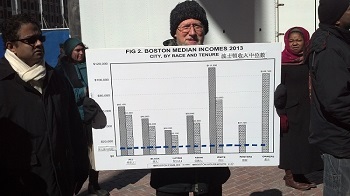 The Boston Tenants Coalition (BTC) is a coalition of grassroots tenant neighborhood groups, community development corporations, and homeless and advocacy organizations that promotes affordable housing in Boston, organized to defend and expand the rights of tenants, and to push city, state and federal government, as well as private industry to address the needs of low-income tenants. We operate from a core belief that more affordable housing needs to be both permanent and targeted to Boston’s low-income populations. Over the past several months, the Stone Scholars Advisory committee, working together with the Boston Tenant Coalition, sketched a research agenda for the Fund that will ensure continuity of the critical annual research Michael had long done on a pro bono basis for our tenant advocacy. A new Boston displacement map explores more about the Boston housing crisis and follows people’s stories about their displacement experiences. Come back soon for event news! Please Donate to Fight for Affordable Housing!